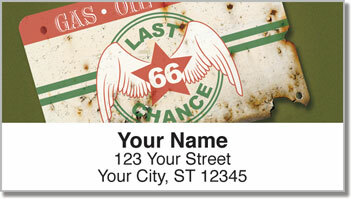 Retro memorabilia from the roadside creates a nostalgic finishing touch for all your letters and packages. Fictional filling stations reminiscent of the '50s and '60s take you back to a time when you could still get full service at the pump. 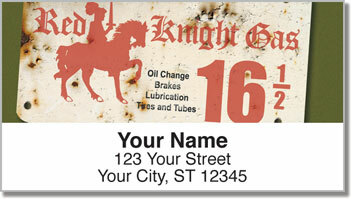 This is a great design for collectors of antique signs or classic advertisements. But what you'll really love about this product is how easy the task of preparing outgoing mail becomes. Forget about scribbling your name and address on every single envelope - those days are over. 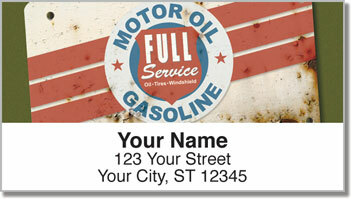 Just stick on a self-adhesive label and be done with it! 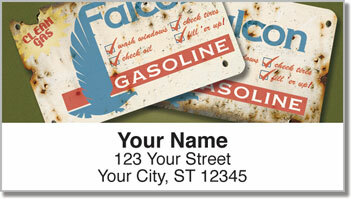 Order your own Vintage Gasoline Address Labels right now! You can also get matching personal checks.